This week saw another milestone for our gorgeous son, Bert. He has now outgrown the baby bath (he's so long!) and had his first dip in the 'big boy bath' on Sunday. When he was first born he hated bath time - I think he felt exposed and vulnerable, and didn't like the sensation of the water. Then at 7 weeks old we took him swimming, and since then he's been a total water baby! 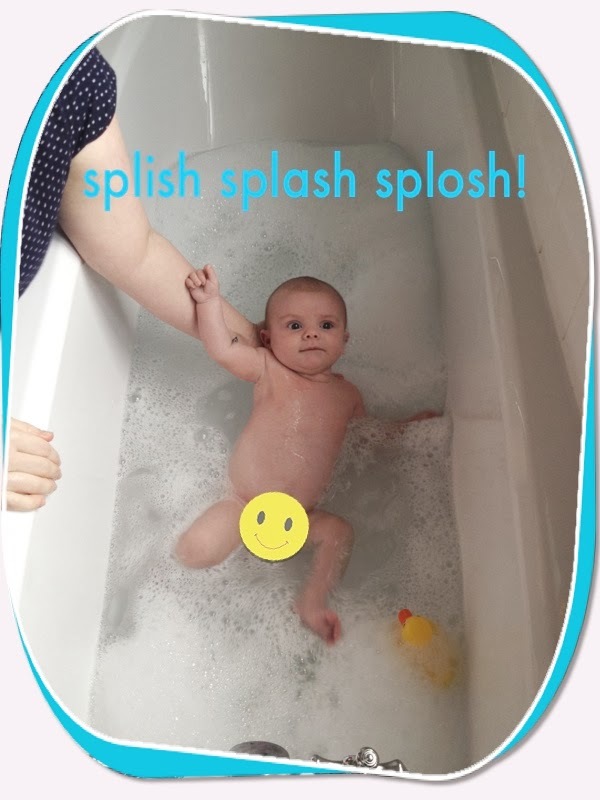 He loved the big bath this week as he could stretch out and kick his legs freely - god help us when he's even bigger, it will be a very splashy time! 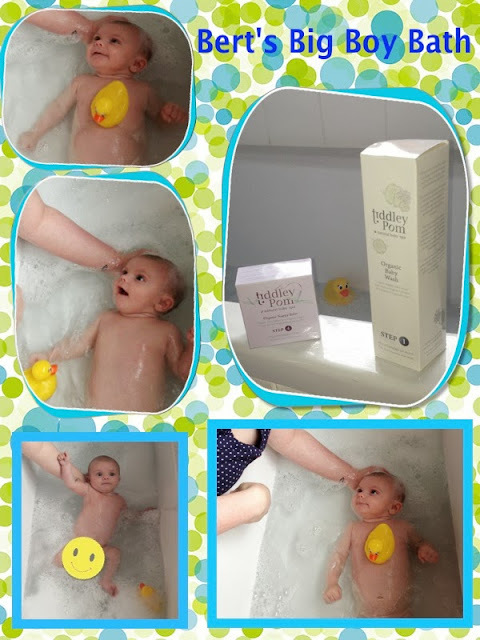 The lovely people at Tiddley Pom Natural Baby Spa sent Bert and I some of their baby spa bath time products to try out - and his first time in the big bath seemed like the perfect time to try it out. We used the Tiddley Pom Organic Baby Wash in the bath, and it was lovely - with smells of English Lavender and Chamomile, it was such a relaxing scent, gentle but fragrant. It bubbled up nicely, and left Bert's skin feeling so soft & smelling even more delicious than he usually does. Tiddley Pom Natural Baby Spa offers ‘something different’. It’s a spa range for babies where the products compliment each other and it’s a way for mums and dads to bond with their babies. My baby aromatherapy, music and massage products can be used on their own but work even more effectively as a complete spa treatment. After his bath we used Tiddley Pom Organic Nappy Balm on his bottom, and this was definitely my favourite product out of the two - it smells heavenly, it has a lovely silky texture, and seems to moisturise and soothe Bert's delicate little bum! The Baby wash is priced at £9.99 for 200ml, and the Nappy Balm is priced at £7.99 for a tub. All of Tiddley Pom's products are organic, gentle on baby skin, and they are infused with aromatherapy oils to help calm your little ones. Although pricier than some baby washes & balms they really are in another league compared to their supermarket brand contemporaries. Also, because of their great quality a little of each product goes a long way. Bert and I certainly loved them! Disclaimer: We were sent 1 x Tiddley Pom Baby wash, and 1 x Tiddley Pom Nappy Balm for the purpose of this review. All pictures and opinions are my own.